Hello and happy Wednesday everyone! I'm excited to share a new project I just completed with the new Graphic 45 "An Eerie Tale" collection. I'm featured today on the Papercrafters Library blog with all kinds of photos and a video tutorial on how I created this fun home decor piece. Be sure to hop over there and check it out. They have a nice prize giveaway over there too, so leave a comment and you'll be entered to win. This is a magical birdhouse!! I love it! TFS! Adorable birdhouse using Graphic 45. FABULOUS birdhouse, Annette! Loved the video. 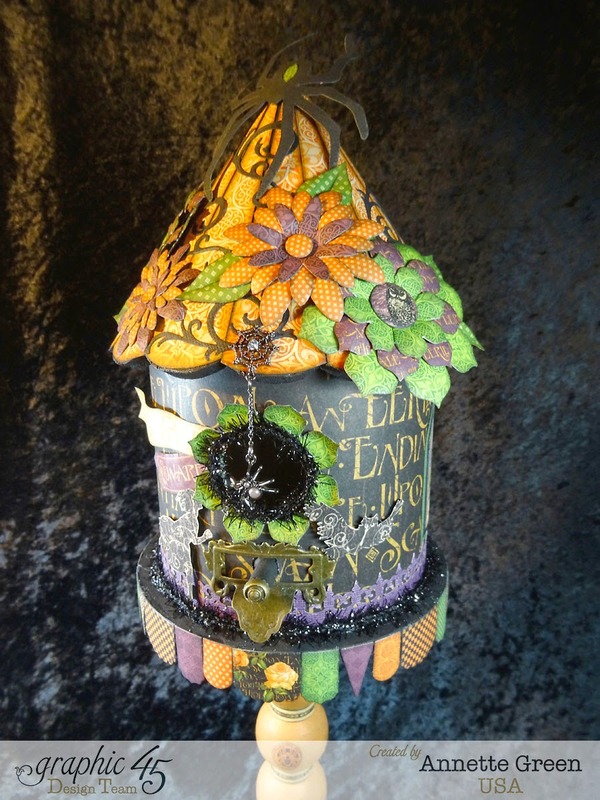 Fantastic birdhouse!I Love Graphic 45 their collections are always so amazing!! Thanks for sharing your creativity and all the inspiration! So glad your on the DT again, love seeing what you will create next! FaBOOlous birdhouse, Annette :) and Fantastic feature at Paper Crafter's Library! XOXO-Shari T.